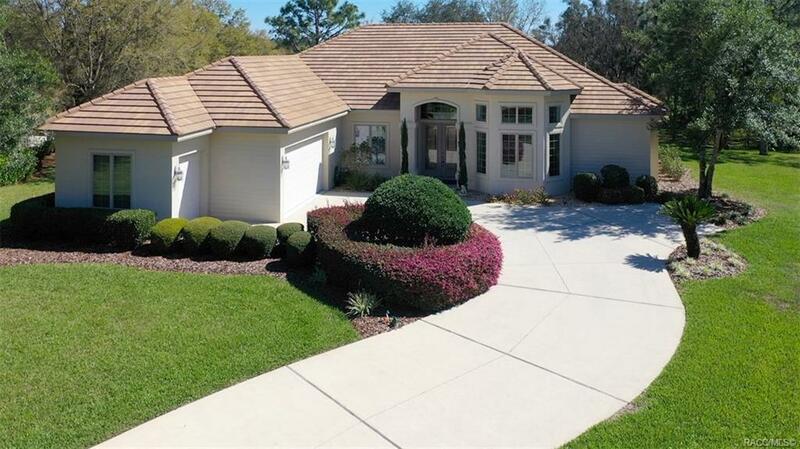 CAPTIVATING ONE OWNER CUSTOM RESIDENCE, MAINTAINED TO PERFECTON, LOCATED IN THE GUARD GATED ENCLAVE OF BLACK DIAMOND RANCH, ONE OF FLORIDA'S PREMIER RESIDENTIAL AND GOLFING COMMUNITIES! Highlights include: Spacious and Open Floor Plan; Chef's Island Kitchen with Double Ovens, Gas Cooktop and Corian Countertops; Grand Master Suite with Lavish Euro Bath featuring a Grohe Shower System & Double Vanities; Lion Size Office and 2 Graciously Sized Guest Rooms one of which is en suite. The Tray Ceiling provides additional volume to the Large Great Room and combined with the Stunning Double Glass Entry Doors and Glass Transoms, this home is truly bathed in natural sunlight. The Great Room opens onto a Spectacular and Colossal Brick paved Lanai with a uniquely custom designed step up oversize Spa with a Double Waterfall Feature. From the elevated lanai, the golf course vistas are simply outstanding! This Residence reflects the casual sophistication indigenous to the Florida lifestyle. Directions: From The Entrance To Black Diamond's Guard Gate: Stay Straight On W Black Diamond Circle. Left On N Prestwick Way. Left On N Carnoustie Loop.